A light brown wicker basket for a new baby. The basket can be kept in the nursery to store bits and bobs. 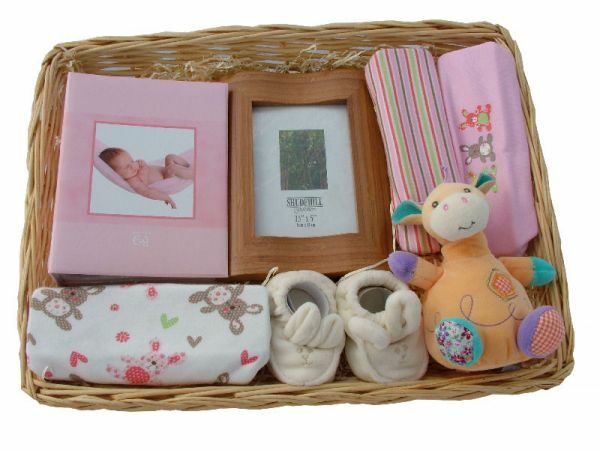 This baby gift basket contains some essentials for the baby and the new parents. It contains; an adorable baby rattle that is really easy for a baby to grasp, a wooden picture frame, a lovely Henzo baby photograph album which holds 100 photographs, the cutest pair of baby bootees and 3 good quality baby body suits (0-3 months).